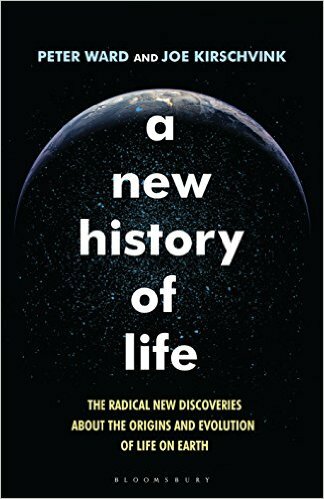 This next book is a Christmas present, A New History of Life by Peter D. Ward and Joe Kirschvink. 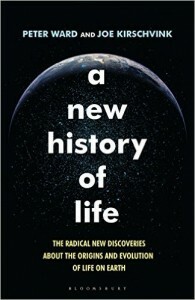 The theme of the book is the evolution of life from the very early periods of life on earth with a particular emphasis on that which has been discovered over the last 20 or so years, they cite Life: A Natural History of the First Four Billion Years of Life on Earth by Richard Fortey as the last comparable work. 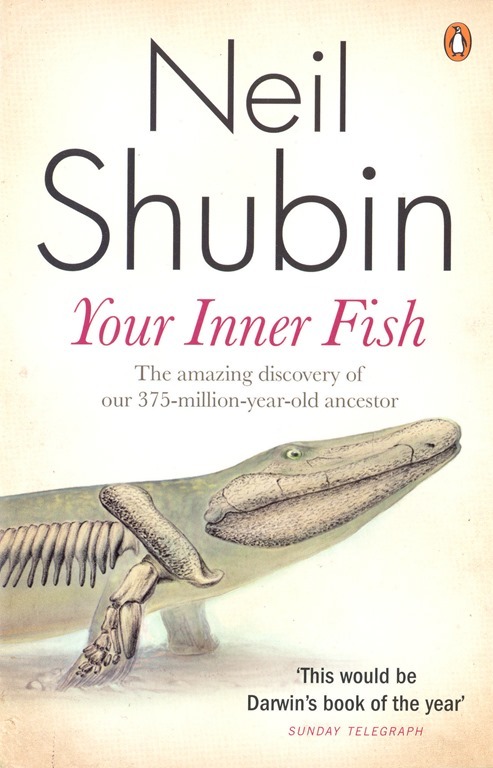 A New History follows a long thread of books I’ve read, some I’ve reviewed here such as Neil Shubin’s Your Inner Fish, others in the prehistory of my blogging such as Stephen Jay Gould’s Wonderful Life: the Burgess Shale and the Nature of History. I’ve also written about First Life, a program narrated by David Attenborough on the earliest life. It turns out quite a lot has happened in the last 20 or so years, radio-dating has improved in sensitivity allowing us to probe the early years of life on earth in more detail, new fossil fields have opened up in China, the chemistry of the early earth is better understood, early “Snowball Earth” episodes have been identified, and the discovery of exoplanets has led to more interest in the very earliest stages of life. 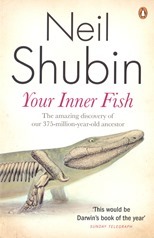 Indeed, Tiktaalik at the core of Shubin’s Your Inner Fish, one of the first vertebrates to walk on the land, was discovered this century. I always feel a little cautious approaching popular books such as this, promising great and revolutionary things, the risk is they present a minority view unsupported by other experts in the field and as an outsider you would be completely unaware of this. Thankfully, this isn’t the case here, Ward and Kirschvink are experts in early life but they are explicit where they own theories come into play and present alternative viewpoints in a fairly balanced way. Half of the book covers the earliest life on earth up to the Cambrian Explosion 600-500 million years ago, when a huge diversity of life suddenly appeared. It seems here that the greatest new research activity has taken place. This includes work on ancient atmospheric composition: the relative amounts of carbon dioxide and oxygen; the “Snowball Earth” periods of complete glaciation where there was only liquid water at the surface due to volcanic activity; the chemistry of early life and the precursors to the Cambrian Explosion such as the Ediacaran fauna and other life such as Grypania and arcritarchs of which I had not heard. Vernanimalcula is also mentioned as the first bilateral animal, a microscopic fossil found in rocks 600 million years old. Although I see from wikipedia that this attribution is disputed. The origins of life have the air of the physicist’s dark matter, their must be something there but we have little direct evidence for what it is and so it is ripe for a wide range of hypotheses. The big problem is the formation of RNA and DNA, experiments have long show that the basic building blocks of life can form in plausible early conditions stimulated by heat and lightning. But DNA and RNA are large, complex molecules, and not particularly heat stable. One of the authors (Kirschvink) is keen on a Martian genesis for these molecules, then transported by asteroid to earth. I’ve always found these extra-terrestrial origins proposals unlikely. A New History highlights the dispute between Stephen Jay Gould and Simon Conway Morris over the Burgess Shale. Gould was a proponent of the idea that the Burgess Shale assemblage represented a massive diversification of forms which of which many are now extinct, whilst Morris sees the forms as precursors to modern forms. Following on from the earliest times the rest of the book is a story of successive mass extinctions followed by diversifications. Aside from the K-T extinction 65 million or so years ago, caused largely by a massive asteroid impact, extinction events were caused by changes in atmospheric chemistry. Typically this involved high levels of carbon dioxide leading to global warming and lower levels of oxygen. These changes in atmospheric chemistry were driven by large scale geology and life. Other than microbes, life struggles to survive when oxygen levels are much below the 21 percent we currently enjoy, conversely when oxygen levels are high large animals can evolve. The dinosaurs prevailed because they could survey at relatively low oxygen levels, and then became giants when oxygen levels rose above current levels. I was amused to discover that reptiles and amphibians can’t run and breathe effectively at the same time, their splayed gait compresses the ribcage inconveniently. Creatures such as the dinosaurs resolved this problem by moving the legs beneath the body, our bipedal stance is even better since breathing and running can work entirely independently. The book starts a little bombastically with comments on how boring history is perceived to be and how new and revolutionary this book is but once it settles into its stride its rather readable. Charles Darwin’s On the Origin of Species was rushed into print after a very long gestation when it became clear that Alfred Russell Wallace was close to publishing the same ideas on evolution. Lacking from the first edition was a historical overview of what went before, pertinent to the ideas of evolution. On the occasion of the publication of the first American edition, Darwin took the opportunity to address the lack. Darwin’s Ghosts: In search of the first evolutionists by Rebecca Stott is a modern look at those influences. 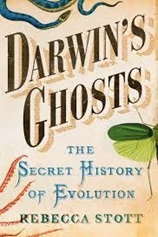 After an introductory, motivating chapter Darwin’s Ghosts works in approximately chronological order. Each chapter introduces a person, or group of people, who did early work in areas of biology which ultimately related to evolution. The first characters introduced are Aristotle, and then Jahiz, a Persian scholar working around 860AD. Aristotle brought systematic observation to biology, a seemingly basic concept which was not then universal. He wrote The History of Animals in about 350BC. The theme of systematic observation and experimentation continues through the book. Jahiz extended Aristotle’s ideas to include interactions of species, or webs. His work is captured in The Book of Living Beings. Next up was a curiosity over fossils, and the inklings that things had not always been as they were now. Leonardo Da Vinci (1452-1519) and, some time later, Bernard Palissy (1510-1590) are used to illustrate this idea. Everyone has heard of da Vinci. Palissy was a Hugenot who lived in the second half of the 16th century. He was a renowned potter, and commissioned by Catherine de Medici to build the Tuileries gardens in Paris but in addition he lectured on natural sciences. I must admit to being a bit puzzled at the introduction of Abraham Trembley (1710-1784), he was the tutor of two sons of a prominent Dutch politician. He worked on hydra, a very simple aquatic organism and his wikipedia page credits him as being one of the first experimental zoologists. He discovered that whole hydra could regenerated from parts of a “parent”. Conceptually the next developments were in hypothesising a great age for the earth coupled to ideas that species were not immutable, they change over time. Benoît de Maillet (1656-1739) wrote on this but only posthumously. Similarly Robert Chambers (1802-1871) was to write anonymously about evolution in Vestiges of the Natural History of Creation first published in 1844. Note that this publication date is only 15 years before the first publication of the Origin of Species. The reasons for this reticence on the part of a number of writers is that these ideas of mutability and change collide with major religions, they are “blasphemous”. This becomes a serious issue over the years spanning 1800. Erasmus Darwin, Charles’s grandfather, was something of an evolutionist but wrote relatively cryptically about it for fear of his career as a doctor. I reviewed Desmond King-Hele’s biography of Erasmus Darwin some time ago. At the time when Erasmus wrote evolution was considered a radical idea, both in political and religious senses. This at a time when the British establishment was feeling vulnerable following the Revolution in France and the earlier American revolution. I have some sympathy with the idea that religion suppressed evolutionary theory, however it really isn’t as simple as that. The part religion plays is as a support to wider cultural and political movements. The core point of Darwin’s Ghosts is that a scientist working in the first half of the 19th century was standing on the shoulders of giants or at least on top of a pile of people the lowest strata of which date back a couple of millennia. Not only this, they are not on an isolated pinnacle, around them are others also standing. Culturally we are fond of stories of lone geniuses but practically they don’t exist. In fact the theory of evolution is a nice demonstration of this interdependence – Darwin was forced to publish his theory because Wallace had essentially got the gist of it entirely independently – his story is the final chapter in the book. For Wallace the geographic ranges of species were a key insight into forming the theory. A feature very apparent in the area of southeast Asia where he was working as a freelance specimen collector. Once again I am caught out by my Kindle – the book proper ends at 66% of the way through, although Darwin’s original essay is included as an appendix taking us to 70%. Darwin’s words are worth reading, if only for his put-down of Richard Owen for attempting to claim credit for evolutionary theory, despite being one of those who had argued against it previously. I enjoyed this book, much of my reading is scientific mono-biography which misses the ensemble nature of science which this book demonstrates.